THE LISTING 27 Howland Rd. 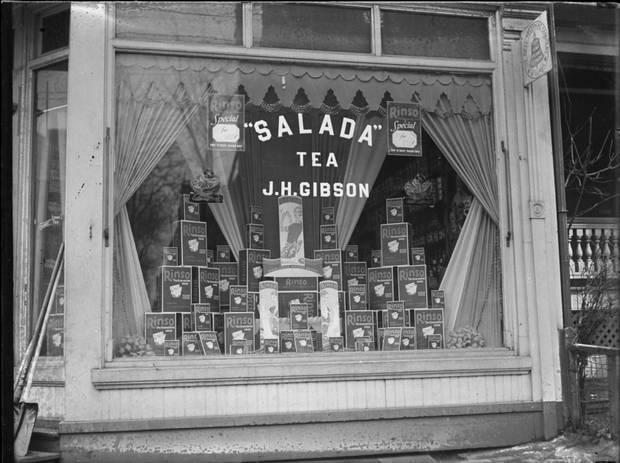 The storefront at 27 Howland Road on February 13, 1931. On Feb. 13, 1931, there was really only one thing that was visible in the large front windows of 27 Howland Rd. ; stacks of Rinso detergent, "The Guaranteed Soap." At that time, the building in Toronto's east end was a corner store that sold, among other things, soap and tea. Fast forward 86 years and the same storefront windows were papered up on Feb. 13. But a month ago, the paper came down and revealed 27 Howland's newest transformation. Not including the finished garage, the house sits at 3,500 square feet. Real estate agent Suzanne Lewis came across the property in early 2016 and was intrigued by the prospect of renovating a former store. "The history really appealed to me," she said, adding that sometime around the 1970s the shop was converted into a residential space. But she knew that working with such a unique property would be a challenge. "I came into the house with zero intention of buying it," she said. "But then I was like, 'Wow.'" The ceiling height, the exterior brick façade and heritage architecture convinced her she needed to take the risk. So she and Kirs Potts from Norseman Construction and Development Ltd. went in together on the property and decided to bring in Derreck Martin to do the interior. Derreck Martin was brought in to transform the building’s interior. Mr. Martin is known for transforming his family's antique warehouse (507 Antiques) into a shared office for creative types, called East Room. However, 27 Howland was his first venture into residential design, but that didn't faze him. "At the end of the day, it's design – it has to be a liveable space," Mr. Martin said. Despite the house being a "bit of a dog's breakfast" when they took possession, Mr. Martin and Ms. Lewis had a plan. The master bedroom has access to an outdoor terrace. "We all agreed on the texture of the house," Ms. Lewis said. "I wanted something natural but with a 'wow factor,' but not glitzy." Mr. Martin provided that by incorporating many industrial, raw materials, including leathered marble countertops in the kitchen and blackened steel touches throughout the house. The design incorporated a lot of raw materials. "When people think of steel, they think of an industrial, rusted look," he said. "But the steel we put in is a lot more refined and tailored." This sleek steel is something Mr. Martin is fond of and is featured in East Room. "Derreck has effortless style," Ms. Lewis said, adding: "I wanted this house to be a kind of echo of East Room." A bedroom on the home’s upper floor. The finished four-storey house features four bedrooms split amongst the upper two floors. The main level is open with the living room off the front, segueing to the dining room and kitchen. Behind that is a powder room and the mudroom, with its access to the backyard, two-storey garage and four-car parking. The basement – which was only partly finished when Ms. Lewis first saw the property – has been converted into a cozy TV room. There is also a full bathroom, laundry and 600-bottle wine cellar in the basement. The house (not including the finished garage) sits at about 3,500 square feet. "It's a really big house with lots of volume and height, so it feels even bigger," Ms. Lewis said. The antique fireplace is among the owners’ favourite features. Both Ms. Lewis and Mr. Martin have a number of features they love. One of them is the antique fireplace in the living room. It's a French limestone fireplace from the Louis XVI era, Mr. Martin said. With the rest of the decor on the main floor being a mix of modern and industrial, the fireplace "gives the building some soul," he said. Another feature that really stands out in the living room is the steel bookshelf that runs between the staircase and the exposed brick wall on the south side of the house. Instead of a traditional backsplash, the kitchen features a grey marble wall. "We wanted to create some sort of layered element," Mr. Martin said, noting the staircase, bookshelf and brick wall are the first things you see when you enter the house. "We also needed to bring in more storage." For Ms. Lewis, one of her favourite details is the marble wall in the kitchen. Instead of doing a tiled backsplash, Ms. Lewis suggested adding the grey marble to the entire wall, including along the side of the doorway that meets the wall. Doing so was tricky, though. It took the construction team three tries to butterfly the bookended marble so it's symmetrical. "It was an expensive feature but worth it because it was so impactful," Ms. Lewis said. The store windows bring a lot of light into the living room. When it comes to her favourite room, Ms. Lewis is definitive: It's the living room with the storefront windows and 12-foot-high ceilings. "You don't feel like you have to fill it up with stuff cause the drama is just there naturally," she said. The paper on the storefront windows didn't come down until the living room was totally finished and staged. And that's when Ms. Lewis had a moment of sheer excitement and pride. "When we took down the paper off the windows three weeks ago, I thought 'Look at what we've done, it's unbelievable.'"